Not your typical Valentine, just as special! I know everyone expects hearts & flowers all over the place for Valentines Day. I like to be different and I think this card still goes right to your heart and says “Be Mine!”. 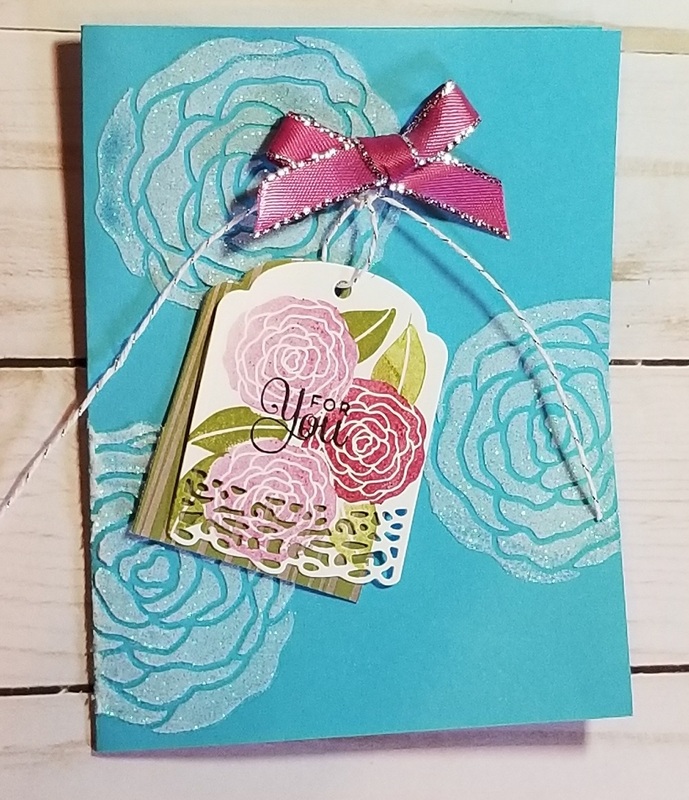 The one thing I would change with this particular card is to do all the embossing paste & decor on a separate layer that is added to the card base, which explains the supply list below. using the SS mask, apply the Shimmery White Embossing paste to the Marina Mist layer, set aside to dry. Place the mask & knife into the bowl of water ASAP the paste will dry quickly and be difficult to remove otherwise. stamp the flowers on the Post-It note and on the Whisper White Scrap – use stamp off method to give some varied depths to the flowers. Cut the flowers out of the post-it note and apply over the ones on the Whisper White, stamp the leaves with Old Olive (stamping off as well for depth). Remove the masking, stamp sentiment in the center. Cut with Sweet Cakes framelits tag & Big Shot. Cut the DSP with Sweet Cake framelit (without the filigree bottom)…do this by not placing the top plate completely over the framelit to keep a square edge. Tie a bow with the Berry Burst Ribbon, (tweezers are good here) thread the silver bakers twin through the back of the bow and tie a knot. adhere to Marina Mist Layer top/center with two glue dots. adhere the Marina Mist layer to the card base with the snail.